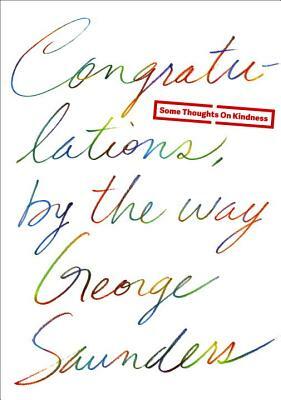 NEW YORK TIMES BESTSELLER • This inspiring meditation on kindness from the author of Lincoln in the Bardo is based on his popular commencement address. Three months after George Saunders gave a graduation address at Syracuse University, a transcript of that speech was posted on the website of The New York Times, where its simple, uplifting message struck a deep chord. Within days, it had been shared more than one million times. Why? Because Saunders’s words tap into a desire in all of us to lead kinder, more fulfilling lives. Powerful, funny, and wise, Congratulations, by the way is an inspiring message from one of today’s most influential and original writers. George Saunders is the author of eight books, including the story collections Pastoralia and Tenth of December, which was a finalist for the National Book Award. He has received fellowships from the Lannan Foundation, the American Academy of Arts and Letters, and the Guggenheim Foundation. In 2006 he was awarded a MacArthur Fellowship. In 2013 he was awarded the PEN/Malamud Award for Excellence in the Short Story and was included in Time’s list of the one hundred most influential people in the world. He teaches in the creative writing program at Syracuse University.